" Articles in Category: Don Siegelman	"
On today's BradCast: Climate change continues to ravage Americans and take lives in the east and west, surprisingly good news from the U.S. Supreme Court, and the U.K. remains gripped with panic, confusion and uncertainty in the wake of last week's vote 'Brexit' vote to leave the European Union. We start today with more on the historic deadly flooding and "mass destruction" in West Virginia 'coal country' and the out-of-control wildfires across bone-dry Southern California. Yes, it's everything we've been warning you about for so long on both The BRAD BLOG and The BradCast, even if just the latest example of the enormous (and growing) cost of climate change, as still both under-reported by the corporate media and over-shadowed by other new events across both the U.S. and world. Then, the U.S. Supreme Court handed down several major decisions on its final day of the session. Surprisingly, a number of those decisions were very good news for progressives, even on an otherwise divided Court with its still-vacant 9th seat. The biggest decision concerned abortion rights in Texas, where the Court dealt a devastating blow to Republican laws meant to shut down women's health clinics under the guise of 'safety'. The Court saw through the Rightwing con, and the 5-3 decision could result in the overturning of similar "TRAP laws" enacted by Republicans in other states. In any event, the decision is a huge setback for rightwing anti-abortion activists and a big victory for those who believe in Constitutionally protected reproductive rights and freedoms. Can we take anything from this decision as to how SCOTUS might eventually rule in the Texas Photo ID voting restrictions case --- another GOP law meant to rob (certain) citizens of their rights for entirely specious reasons? Also, the right of states to restrict the possession of guns by domestic abusers was upheld in a surprising bi-partisan 7 to 2 opinion, as was a new rule by the U.S. Dept. of Labor concerning overtime pay for home healthcare workers. In an unusual unanimous decision by the Supremes, Virginia's former Republican Governor Bob McDonnell saw his bribery conviction vacated, despite having accepted some $165,000 in personal gifts and cash loans from a wealthy businessman hoping the Governor would help promote his products. Will that decision have any effect on Alabama's former Democratic Governor Don Siegelman, who is now serving his 6th year in federal prison for having done far less than McDonnell was found guilty of? That, even as the Republican federal judge who sentenced Siegelman has resigned from the bench after having been arrested for beating his wife and the Republican heads of all three branches of government in Alabama face removal of office via impeachment (Governor), ethics charges (Chief Justice of the AL Supreme Court) and multiple felony conviction (AL Speaker of the House) for various crimes, alleged and proven, in their home state. Finally today, last week's 'Brexit' vote continues to wreak havoc as world financial markets continue to plunge (though not nearly as low as I incorrectly reported it on today's show, as based on an inaccurate number reported by my iPhone's stock app! ); the British government is in complete disarray about how (or, perhaps, even, if) they will officially begin the formal procedure required to leave the EU; voters express 'bregret' over having voted to exit; questions arise about overseas voters failing to correctly receive ballot papers at all; and some call for a second ("do-over") referendum. 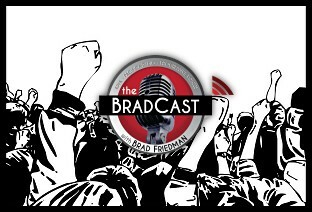 All of that and much more on yet another insanely busy BradCast today! 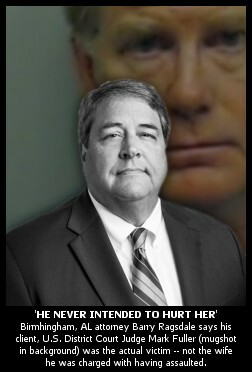 From the new effort by more than 100 bipartisan state Attorneys General to see former AL Gov. Don Siegelman (D) turned political prisoner receive a pardon from President Obama; to the obscene amount of corporate and billionaire cash now pouring into U.S. House Speaker Paul Ryan's Republican campaign machine; to new lawsuits filed in Arizona by the DNC (with both the Clinton and Sanders camps joining), as well as by transpartisans charging voter suppression in the state's disastrous March 22nd primary; to remaining concerns about the results of recent Presidential nominating contests around the country. All of those stories, including the increasingly loud insistence (whether supported by the evidence or not) from Sanders and Trump supporters who believe that both major political parties have "rigged" the Presidential nomination selection process against their favored candidates, underscore how the broken U.S. system desperately needs fixing. 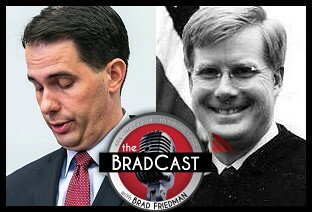 Today on The BradCast, new polls reveal Bernie Sanders far outpacing Hillary Clinton in head-to-head match-ups against all potential Republican challengers and public sector unions take a beating in the U.S. Supreme Court. First up today, new pre-election polls from NBC/WSJ and PPP in both Iowa and New Hampshire echo recent national polling suggesting that, contrary to so-called "conventional wisdom", Sanders is more electable against the leading Republican opponents than Clinton is. 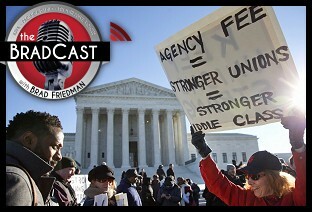 Then, constitutional law expert Ian Millhiser joins us to report on today's "brutal" oral arguments before the U.S. Supreme Court in Friedrichs v. California Teachers Association, a case which threatens to gut public sector union funding. Millhiser, author of the new book, Injustices: The Supreme Court's History of Comforting the Comfortable and Afflicting the Afflicted , was at the Court for today's hearing, and the news is not encouraging. As he explains, the case challenges the federal government's allowance of "agency fees" charged to non-union members in public sector union shops to help defray the costs of union negotiations. That fee makes sense, since non-union workers must receive the same wages and benefits at such shops as their union colleagues. Non-union workers benefit from those negotiations, he says, since "workers in unionized shops on average receive about 12% more pay than workers in non-unionized shops." "As a general rule," Millhiser wrote after today's oral argument, "the First Amendment does not permit the government to compel someone to say something they disagree with, and the plaintiffs claim that requiring non-union members to subsidize collective bargaining by a union that they may not agree with essentially rises to the level of compelled speech." He tells me today that striking down the right to charge these agency fees "creates what's called a 'free rider' problem. If I get something, whether I pay for it or not, a lot of people are going to say 'Well, why would I pay for this when I get it for free?'" That, in turn, threatens the viability of such unions entirely. Millhiser goes on to say: "It was pretty clear today that there were five votes that are ready to strike down these agency fee agreements --- and that's going to be not great for the future of many public sector unions." We also discuss how an adverse decision for the public unions here may also potentially be used by the Right to go after private unions as well. "What we've seen from conservative movement attorneys over the last seven or eight years is an extraordinary entrepreneurship. They've been really, really clever in coming up with creative news ways to try to convince courts to implement their policy preferences," he says. Citing both that point and Texas Gov. Greg Abbott's new call for nine, incredibly radical (and regressive) amendments to the U.S. Constitution (which Millhiser describes as the new Republican governor's "plan to repeal the 20th century"), I ask why it is that Democrats and progressives don't show similar "entrepreneurship" in pushing forward their own agenda. In response, Millhiser defends Dems and progressives by noting a peculiarity about this particular moment in history: "I think conservatives right now increasingly believe that the last 80 years of American history are illegitimate. They believe that our society has started to go off the rails and we have to fundamentally rethink what our government does. Democrats are now in the unfamiliar position of being the nation's conservative party. I don't mean in the sense that they are now to the right of the Republicans. I mean 'conservative' in the sense that Democrats are conservative in the sense that it wants to preserve the gains that we already have." The result is that Dems are put on the defensive, instead of pushing new, progressive programs forward, as I argue in return, leaving voters less than clear about what it is Democrats hope to do when and if they are elected to office. Finally, we offer a short goodbye to David Bowie and receive late breaking word from the the U.S. Supreme Court concerning imprisoned former Gov. 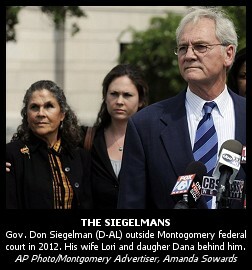 Don Siegelman (D-AL)'s final appeal for a new trial...Neither of those news items are encouraging either, unfortunately. U.S. District Judge Mark Fuller "will not qualify for either a judicial salary or be eligible for a judicial pension," according to a statement just released by the bi-partisan leaders of the U.S. House Judiciary Committee. His resignation from the federal bench "in shame", as the statement describes Fuller's stated intention to step down as of August 1, will disqualify him from any further payment for his role on the federal judiciary. In their statement, posted in full below, committee chair Rep. Bob Goodlatte (R-VA) and ranking member Rep. John Conyers (D-MI) make clear that they were prepared to consider impeachment of the federal judge, prior to the resignation letter he tendered to the President over the weekend. 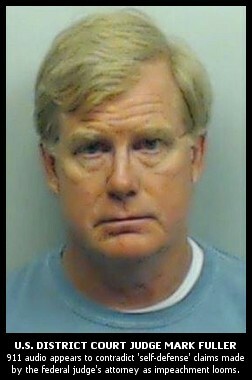 Fuller, a 2002 George W. Bush-appointee to the federal bench in Alabama's Middle District, was arrested last August on charges of beating his wife at a hotel room in Atlanta. Prior to that, he had been most well known for overseeing the controversial trial of Alabama's former Democratic Governor Don Siegelman. "It is a rare occasion when the U.S. Congress impeaches a federal judge and removes the accused from the bench, but it is a necessary tool to protect the integrity of our judicial system," the two high-ranking Congressmen say in their joint statement. 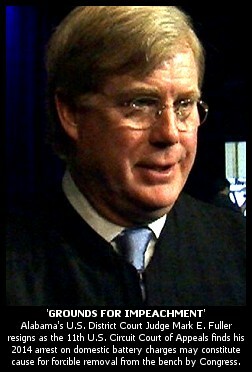 "However, the House Judiciary Committee was prepared to initiate impeachment proceedings against Judge Fuller pending the recommendation of the Judicial Conference of the United States, and the Committee strongly encouraged the courts to expedite the investigation into Judge Fuller's misconduct." On Monday, as we reported in detail, following a nearly 10-month probe of the incidents surrounding the disgraced Judge's arrest in 2014, the 11th Circuit Court's Judicial Conference issued an order [PDF] stating that the matter "might constitute one or more grounds for impeachment." Unless he had voluntary stepped down, impeachment would have been the only way to remove Fuller from his lifetime appointment to the bench, despite the charges of domestic abuse. Judge Fuller submitted his resignation to the President late last week in advance of the publication of the Judicial Conference's order, but questions had remained about whether he had struck a deal that would allow him to accept a retirement pension after stepping down from his $200,000/year job. Over the weekend, the news broke that U.S. District Court Judge Mark E. Fuller (Middle District of Alabama), who was arrested almost one year ago after allegedly beating his wife bloody in an Atlanta hotel room, has finally submitted his resignation from the federal bench to President Obama. Previously, through his attorneys, Fuller had strenuously refused to step down, declared his innocence, and insisted that a 5-judge Special Committee convened by the 11th Circuit U.S. Court of Appeals to investigate the matter would eventually clear him of wrongdoing. It appears instead that the panel has found "grounds for impeachment" instead. That finding has been "unanimously adopted" by the Circuit's full Judicial Council which is sending its report and recommendations to the U.S. Judicial Conference. That body, in turn, may then decide whether to recommend the U.S. Congress take up such rare proceedings. Without a federal judge voluntarily stepping down, impeachment by Congress is the only way to remove a sitting federal appointee to the bench. 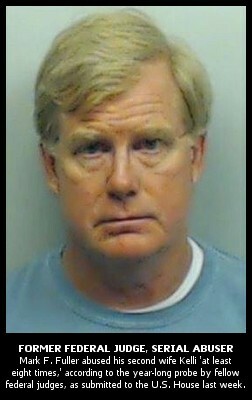 Fuller, who would not otherwise be eligible to draw retirement pension for another three years, will continue to draw a salary from taxpayers for two more months --- just as he has for the last 10 months --- despite having had his caseload reassigned to other judges in the immediate aftermath of his arrest a the Ritz-Carlton hotel in Atlanta in early August of 2014. "Justice was not served here," said Rep. Terri Sewell (D-AL) in a statement over the weekend in response to the news of Fuller's resignation. Alabama's only Democratic Congressmember had long been calling for impeachment proceedings. "Fuller failed to uphold our most fundamental values," she said. "Perhaps the only consolation is that he has chosen to spare his family and our nation of the expense of a drawn out impeachment process." The rest of the state's Congressional contingent, including its two Republican U.S. Senators who had originally supported Fuller's appointment in 2002, had also called for him to step down. Many offered statements approving of his decision over the weekend to finally step down. Despite the tendered resignation, however, impeachment proceedings could still legally be carried out in the U.S. House, though the likelihood of that may now somewhat diminished. 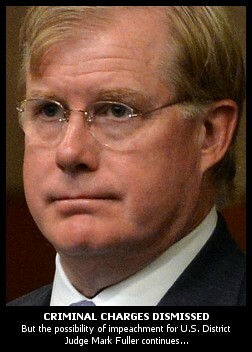 Following his arrest, Fuller was able to strike a plea deal for a pretrial diversion program with the state court in Georgia in order to have his criminal record entirely expunged after just 24 weeks of once-a-week domestic abuse counseling and a court-ordered drug and alcohol evaluation. He was offered the deal by the judge on the premise that the incident at the Ritz-Carlton in Atlanta --- when his wife called 911 in tears, asking for help and claiming that "he's beating on me!" --- was his first infraction. Records from his messy divorce in 2012, however, suggest that there were very similar incidents of physical abuse, as well as drug and alchohol abuse, involving his first wife and their children during the first marriage. Judge Fuller's first wife, Lisa Boyd Fuller, had accused Judge Fuller of having an affair with his then court bailiff, Kelli Gregg who he would marry shortly after his divorce from Lisa was finalized. The records from those proceedings were sealed over her "strenous objections". During the incident at the Ritz-Carlton hotel last year, Kelli accused her husband of having an affair with a court clerk. We've reported for years about the ease with which foreign entities could hack a computerized US election with little possibility of being discovered. Well, guess what classic book was reportedly found on 'Bin Laden's Bookshelf'? 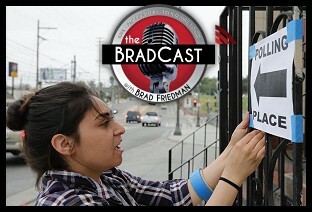 We discuss on today's BradCast! Then, my guest is the imprisoned Gov. 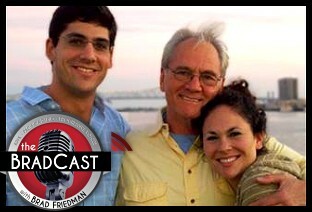 Don Siegelman (D-AL)'s son Joseph Siegelman (pictured above with his father and sister Dana just before his father was sent back to federal prison in 2012 to serve out his 6.5 year sentence on "bribery" charges), on the latest disturbing ruling by the 11th Circuit Court of Appeals concerning his father's appeal for a new trial and/or reduced sentence in his outrageously politicized prosecution by the Bush Administration. Joseph, now an attorney, explains what the court's decision this week means; where the case goes from here; whether he thinks the Obama Administration will ever right the wrong; and how you can help to restore justice in this matter. "This is something that shouldn't happen in America," he told me. "If a sitting governor can be unseated and prosecuted and imprisoned for something that he did not do --- and for something that had not even been considered a crime in this country until he was convicted of it --- what chance do anyone one of us have?" After a bunch of breaking news on The BradCast today --- out of Baltimore, on Gov. Don Siegelman (D-AL)'s rejected criminal appeal, on Jeb Bush's latest easily disprovable nonsense in hopes to rewriting Iraq and his brother's criminal culpability in it --- I was delighted to move on to some very encouraging news out of Nebraska. On Wednesday, in Nebraska's unique, non-partisan unicameral state Senate, Republicans and Democrats voted --- with a "veto proof majority" --- to end the use of the death penalty in the state. The move, in the pretty deeply Republican state, seems to have shocked many, particularly with the state's Republican Governor having just announced his purchase of a a new batch of drugs to kill people with...from a very questionable source. 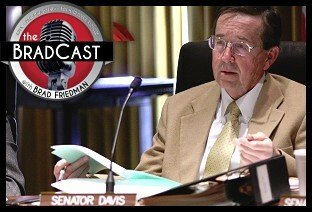 State Sen. Al Davis (R-District 43), one of those who voted to end the state's immoral killing of prisoners, joined me on today's show to explain why he voted as he did (on this matter and in the recent bipartisan rejection of a polling place Photo ID voting restriction); whether he believes the "veto proof" majority on the death penalty ban will hold at this point; why the state's unicameral, non-partisan chamber seems to result in common sense alliances rarely seen elsewhere across our dysfunctional partisan landscape; and what other surprising moves (yes, increased taxes and more!) may soon come out of the majority Republican statehouse. A federal appeals court has upheld the bribery conviction and prison sentence of former Alabama Gov. Don Siegelman. The 11th US Circuit Court of Appeals ruled Wednesday that Siegelman was not entitled to a new trial. The judges also upheld Siegelman's 78-month sentence. The ruling is the latest legal blow to Siegelman, who has been fighting to overturn his 2006 conviction in a government corruption case. A federal jury convicted Siegelman of appointing former HealthSouth CEO Richard Scrushy to a state board in exchange for campaign donations. Siegelman is projected to get out of prison in 2017. See below for an appearance of mine on Thom Hartmann's television show in 2013 discussing the status of the Siegelman case at the time. Hartmann describes him as "America's Political Prisoner". The appearance coincided with the dismissal of the conviction against former Republican U.S. House Majority Leader Tom DeLay for money laundering hundreds of thousands of dollars. 113 bi-partisan former state Attorneys General have stated that what Siegelman was convicted of had never been a crime until he was charged with it. The court's decision, however, could help to finally clear the way for clemency or a pardon from the President, as advocates have long sought. See Jeffrey Toobin's January 2015 New Yorker column calling for same. Meanwhile, U.S. District Court Judge Mark Fuller (the former head of the Alabama GOP and George W. Bush-appointed federal judge who oversaw Siegelman's trial and sentencing after refusing to recuse himself despite long-held grudges against the popular Democratic governor) remains a free man. His criminal record has been expunged despite having been arrested for allegedly beating his wife in a hotel room last summer. (911 call here and embed below.) 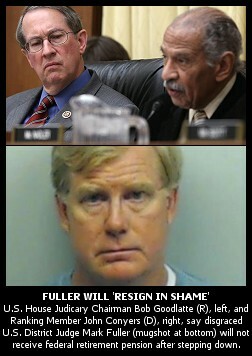 Unless impeached by Congress, Fuller will retain his $200k/year seat on the federal bench for life. 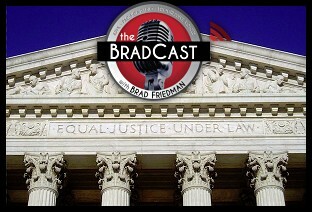 UPDATE 5/22/2015: My BradCast interview with Siegelman's son Joseph, in response to the news above and what the Siegelman legal team plans to do next, is now posted here. Though the official criminal charges against him "no longer exist", Fuller --- who maintains his innocence in the matter, as detailed to The BRAD BLOG by his attorney recently --- may still be impeached by Congress. Indeed, impeachment is now the only way Fuller will face real accountability or be removed from his lifetime appointment to the federal bench. 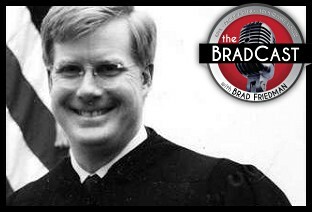 On this week's BradCast on KPFK/Pacifica Radio, we air, for the first time, the complete EXCLUSIVE audio obtained via public records request from the Atlanta PD, that appears to contradict 'self-defense' claims by U.S. District Judge Mark Fuller following his arrest on domestic battery charges last year after his wife called 911 claiming he was "beating on her". I also update my report on Fuller with new comment in response from Fuller's attorney, Barry Ragsdale. In a new interview with the Los Angeles Times, the attorney of Federal District Judge Mark F. Fuller (11th Circuit, Alabama, Middle District) says Fuller was simply "defending himself" against his wife when she called 911, said she was being beaten, requested an ambulance, and was then found bloodied by police in an Atlanta hotel room in August of 2014. That claim would appear to be at odds with the available audio evidence from the 911 call, segments of which were aired on MSNBC last year, and since obtained in full by The BRAD BLOG via public records request from the Atlanta Police Department. We publish the audio, in full, below for the first time, as it appears to contradict new claims by Fuller's attorney. The interview with the LATimes also appears to confirm that the special five-judge panel convened by the 11th Circuit Court of Appeals to investigate the disturbing incident and make recommendations for action to that Circuit Court's Judicial Council is investigating very similar claims of domestic violence and substance abuse made by Fuller's first wife Lisa during their 2012 divorce proceedings.